We've taken the guesswork out of setting up your own personal PA system and put together a package with everything a band, presenter or house of worship may need for their next event with a much lower price tag than buying everything a la carte. 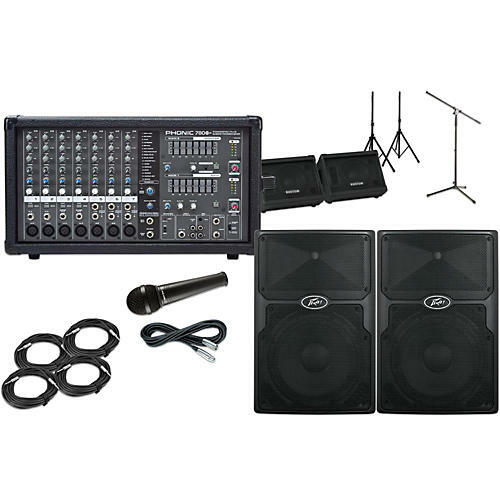 Included in this live sound package is a Phonic Powerpod 780 Plus 7-channel powered mixer, a pair of Peavey PVX 12" passive PA speakers, a pair of Kustom KPC10M 10" monitors, two Gear One MV1000 handheld vocal microphones, and all of the accessories you'll need to get set up. This is a great bundle for medium-sized events and venues. The Phonic Powerpod 780 Plus is a 7-channel powered mixer built into a compact and durable molded cabinet. The Powerpod 780 mixer has a built-in 300W + 300W / 4 ohm stereo amplifier which is patchable. 2 super Hi-Z inputs optimized for direct instrument input allow for the addition of guitars and other instruments. The Phonic Powerpod 780 mixer features onboard digital effects, 32/40-bit digital effects processors with 16 preset programs plus parameter control for each effect's main parameter and footswitch jacks. The Powerpod 780 also has 7 balanced mic inputs, and 10 line inputs. The 3-band EQ on every channel, and a dual 7-band graphic EQ with selectable In/Out switches give you maximum control over your mix. Phonic includes 2 - 20' speaker cables and dynamic mic with cable with Powerpod 780 powered mixer. Peavey PVX 12 passive loudspeakers deliver superior sound quality by utilizing advanced materials like its lightweight, roadworthy molded polypropylene exterior. Lightweight, durable and voiced for live music or speech applications, these two-way speaker systems will handle 400 watts program and 800 watts peak power and feature heavy-duty woofers, 2-3/8" voice coils and the Peavey RX14 1.4-" titanium diaphragm compression driver coupled to a constant directivity horn. The 10" Kustom KPC10M Monitor Speaker Cab boasts a horn and a specially voiced crossover to ensure clear separation of frequencies for crisp, full-range audio reproduction. The speaker cabinet's 10" woofer delivers punchy low frequencies, while a 2" x 6" horn produces bright, high-end tones. The KPC10M monitor cab is equipped with two parallel input jacks. Sturdily constructed, Kustom gives the monitor reinforced corners and heavy-duty Tolex covering. The Kustom KPC10M speaker also offers 30, 60, and 90 positioning. The Gear One MV1000 dynamic handheld vocal microphone is ruggedly built with a crisp, clear presence, and cardioid polar pattern for rear isolation and higher gain before feedback. It comes with a stand adaptor and a one-year warranty.